In March, I joined a brilliant 3-day seminar of 60+ researchers, funders and policymakers brought together to highlight opportunities and challenges of interdisciplinary research in meeting Sustainable Development Goals. 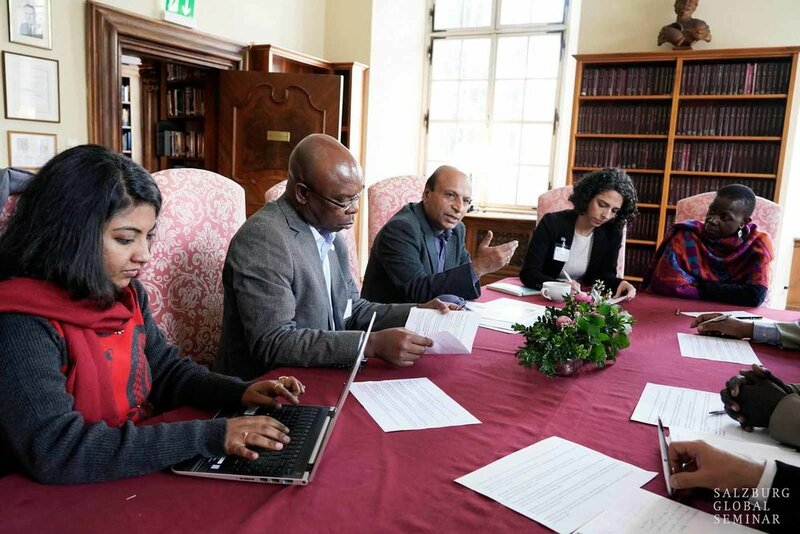 The session was convened by Salzburg Global Seminar in partnership with the UK Global Challenges Research Fund and with UK Research and Innovation. Salzburg Global has held 500+ similar events since post-World War II, bringing people together to address complex challenges and build networks. Interdisciplinary research is what it sounds like. It brings together minds from diverse fields, attempts to break siloed thinking, and tackles research challenges from varied viewpoints. It also has challenges. According to journal Nature in 2015: ‘Research that transcends conventional academic boundaries is harder to fund, do, review and publish — and those who attempt it struggle for recognition and advancement.’ This sentiment was echoed through the seminar. Through interactive exercises and discussions, we mapped interlinkages and tensions between the SDGs that relate to four sectors of climate change, conflict, health and education. We also discussed strategies for communicating complexity and shaping policy to help countries meet those SDGs. Finally, we jointly offered recommendations to research funders, policymakers and practitioners for future research. More than ever, research findings must compete with a whole lot of other messaging. That means research communication should be targeted, with the fat trimmed off so that a journalist or politician or citizen can understand the important bits right away. By nature, research findings can be complex, and complexity takes time to clarify. Assuming that audiences such as citizens and government representatives and politicians may not have much time, then it makes sense for research teams to ensure their messages are clear, compact, and punchy. Research findings will often need to exist in different formats, whether as news, a series of memorable events, communication campaign, or visual experience featuring stories that audiences can connect with. This can be a new, but exciting, world for research teams that may be more accustomed to production of written content for academic publications. For research teams that want to rise above the noise, there is incredible value in finding great communicators. Just as there are people who love conducting cutting-edge research, equally, there are people who love to communicate it. A great starting point, then, is for research teams to align with people who know and love research communication. Yes, information overload is real, but there are also tremendous storytelling opportunities for research teams that take the plunge into the world of faster, visual, online communication. Not everyone sees science and research in the same way. In general, researchers see empirical knowledge, science, and expertise as necessary, but they are not the ‘be all, end all’ to influence behaviour and lead to positive change. Some audiences may just value science and research differently, or may see research as vulnerable to politics, corruption, and falsification. Dialogue, not dissemination. Researchers can tend to see ‘communication’ as one-way, and indeed, this is reflected even right down to project terms of reference, when research teams are asked by donor teams to produce a ‘dissemination’ strategy that assumes that production will lead to uptake. But at Salzburg, we repeatedly returned to the idea that localised, contextualised dialogue and conversation can be more effective creators of change. Communication throughout the research process. Communication and conversation around research needs to start before the research, not as an add-on at the end. Involve communicators, and craft your research messages. We talk about the gap between research and policymakers, but this overlooks communities and citizens. For well-thought communication, researchers need to consider message, language, and medium.